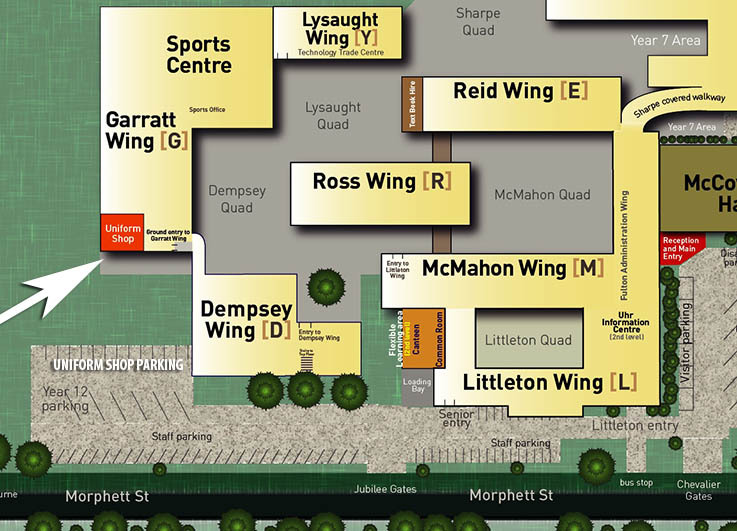 The Daramalan Uniform Shop is located at the rear of the College within the Garratt Wing adjacent to the Sports Oval. Parking is available in the Senior Student car park. Click here for the current High School and College Uniform requirements. The Shop can be contacted direct by email on shop@daramalan.act.edu.au or by phone on (02) 6245 6314. Click here for the Daramalan uniform brochure download. Friday: 8.30am to 4.00pm. (Closed for lunch 12.00 – 12.30pm). The Uniform Shop will be closed from Friday 12 April reopening on Friday 26 April. Friday 26 April: 9.00am to 4.00pm. (Closed for lunch 12.00 – 12.30pm). Saturday 27 April: 9.00am to 4.00pm. (Closed for lunch 12.00 – 12.30pm).